General Goal: To know the cause of this disease, the most common modes of transmission, the major manifestations, and the major complications of this disease. 1. identify the cause of this disease (hint: safety pin appearance). 2. recite the common means of transmission and identify the major disease manifestations. 3. identify what type of pathogen this bacterium is [ex. extracellular, intracellular (what cell does it dwell in)]. 4. tell what groups of people and occupations are more likely to get this disease and how to avoid getting infected with this pathogen. Reading: MEDICAL MICROBIOLOGY by P.R. Murray, K.S. Rosenthal, G.S. Kobayashi and M.A. Pfaller, 6th Edition. pp. 310-311. Simonet, M, B. Riot, N. Fortineau, P. Berche. 1996. Invasin production by Yersinia pestis is abolished by insertion of an IS200-like element within the inv gene. Infect. Immun. 64(1):375-9. K.A. Fields, M.L. Nilles, C. Cowan, S.C. Straley. 1999. Virulence Role of V antigen of Yersinia pestis at the bacterial surface. Infect. Immun. 67(10):5395-5408. Heath, D. G., G. W. Anderson, Jr., J. M. Mauro, S. L. Welkos, G. P. Andrews, J. Adamovicz, and A. M. Friedlander. 1998. Protection against experimental bubonic and pneumonic plague by a recombinant capsular F1-V antigen fusion protein vaccine. Vaccine 16:1131–1137. Plague or black death is an infection of rodents caused by Yersinia pestis and accidentially transmitted to humans by the bite of infected fleas. 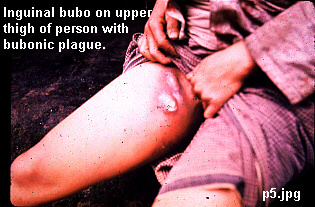 The disease follows urban and sylvatic cycles and is manifested in bubonic and pneumonic forms [note: bubo is derived from a Greek word for groin]. The Black Death was one of the great epidemic scourges of mankind. It swept across Europe and Asia in a series of devastating pandemics during the Middle Ages. This disease was responsible for the death of one-third of the world's population at that time. For largely unknown reasons, bubonic plague ceased to be an important pandemic disease. No major epidemics have occurred in Europe or North America in more than a century. In 2002 two residents of New York City acquired plague from New Mexico. It is also on the list of possible agents that could be used by terrorists. Especially since transmission by aerosols results in a very deadly form of this disease that then can spread from person to person. Click on image to get an enlarged view of this image. Urban cycle: an explosive pandemic disease with high mortality killing 100 million in the 6th century and 25 million in the 14th century. Human to human transmission: By droplets (pneumonic) or by fleas. Pneumonic plague has not been reported in the U.S. since 1925. 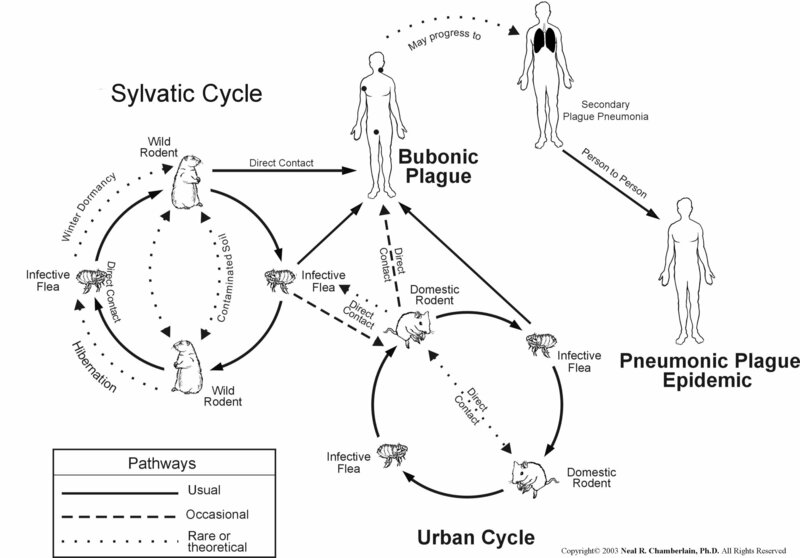 Sylvatic cycle: almost all cases of plague since 1925. Incidents are on the rise, but are limited to the western U.S.
Enzootic plague. Resistant hosts maintain a low-profile, stable rodent-flea infection cycle, e.g., voles and deer mice. Plague is endemic in the U.S. Here is a picture of the endemic regions. This figure also demonstrates where plague is endemic in the world. Epizootic plague. Sensitive or moderately-resistant hosts are infected by fleas or by ingestion, resulting in a highly visible die-off, e.g., rats, prairie dogs, rock squirrels. PATHOGENESISYersinia pestis is primarily a rodent pathogen, with humans being an accidental host when bitten by an infected rat flea. The flea draws viable Y. pestis organisms into its intestinal tract. These organisms multiply in the flea and block the flea's proventriculus. Some Y. pestis in the flea are then regurgitated when the flea gets its next blood meal thus transferring the infection to a new host. 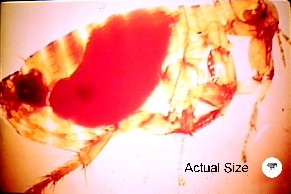 While growing in the flea, Y. pestis loses its capsular layer. Most of the organisms are phagocytosed and killed by the polymorphonuclear leukocytes in the human host. A few bacilli are taken up by tissue macrophages. The macrophages are unable to kill Y. pestis and provide a protected environment for the organisms to synthesize their virulence factors. The organisms then kill the macrophage and are released into the extracellular environment, where they resist phagocytosis (YopH and YopE; Yersinia outer membrane protein) by the polymorphs. The Y. pestis quickly spread to the draining lymph nodes, which become hot, swollen, tender, and hemorrhagic. This gives rise to the characteristic black buboes responsible for the name of this disease. Within hours of the initial flea bite, the infection spills out into the bloodstream, leading to involvement of the liver, spleen, and lungs. The patient develops a severe bacterial pneumonia, exhaling large numbers of viable organisms into the air during coughing fits. 50 to 60 percent of untreated patients will die if untreated. As the epidemic of bubonic plague develops (especially under conditions of severe overcrowding, malnutrition, and heavy flea infestation), it eventually shifts into a predominately pneumonic form, which is far more difficult to control and which has 100 percent mortality. When placed at 37o C, low-Ca2+ concentrations and in a nutrient rich environment a plasmid (70-kbps called pYV or pCD1) encodes the Yop (Yersinia Outer membrane Proteins) virulon and a type III secretion apparatus called Ysc or Yersinia SeCretion. There are 29 different Ysc proteins which assemble to form a pore in the inner and outer membrane of the bacteria. Once the bacterium makes contact with a eukaryotic cell certain translocator Yops will form a pore in the eukaryotic cell. Effector Yops then go across the channel formed through the bacterial and eukaryotic membranes and obtain access to the eukaryotic cell's cytoplasm. There are at least 6 different effector Yops which when transported into the eukaryotic cells inhibit phagocytosis, inflammation, and induce apoptosis of macrophages. This plasmid also encodes the V antigen that appears to also be involved in the type III secretion apparatus. The V antigen also appears to have immunosuppressive effects on the host's immune system. Virulence is enhanced by another 9.5-kb plasmid (pPst or pPCP1) that encodes the outer membrane protein plasminogen activator (Pla). Pla is a protease that interferes with blood coagulation and complement activation pathways. Yet another 100-kb plasmid (pFra or pMT1) also enhances virulence. It contains the genes for the capsular protein (fraction 1) and a murine toxin. Some believe the capsule enhances resistance to phagocytosis by monocytes. Incubation period of 1-3 days (pneumonic) or 2-6 days (bubonic). Septicemia without lymph node involvement (primary septicemic plague, 10-15% of the cases); depends on level of lymph node inflammatory response. Complications: The most common complication of bubonic and septicemic plague is disseminated intravascular coagulation (DIC), pneumonia and meningitis. Death: The patient usually dies of endotoxic shock. Pain or tenderness at the regional lymph nodes, which may enlarge to be called buboes (pic 2). Septicemia is intermittent at first but rapidly becomes constant. Diffuse, hemorrhagic changes in the skin plus cyanosis from the necrotizing pneumonia produce the dark skin at the extremities giving rise to the term "black death." Example of sepsis and necrosis of nose and fingers. Excruciatingly painful, inflamed regional lymph nodes. Exposure to rodents, rabbits, or fleas in the western U.S. Blood and bubo aspirates and sputum should be Giemsa stained. 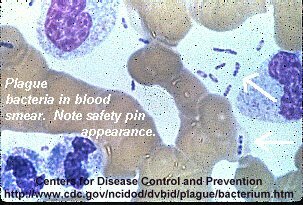 Smears typically show the bacillus to have a bipolar or "safety pin" appearance. Send smears to a reference lab for fluorescent antibody microscopy. Most Gram-negative bacteria produce colonies within 24 h; F. tularensis and Y. pestis do not. Yersinia pestis poses a serious infectious hazard for nursing and laboratory personnel. Protective clothing and a full face respirator should always be worn when working with this organism. Cultivation and virulence testing of this organism should be attempted only in P-3 containment facilities by staff who have been immunized recently with live attenuated vaccine. Without treatment, fatality rates: up to 90% for bubonic plague, 100% for septicemic or pneumonic plague. Treatment, fatality rate= (5-20%). Rapid treatment is critical to improved survival. Gentamicin or streptomycin can be used. ß-lactams are not useful. Isolate patients in case pneumonia develops. By law, patients with pneumonic plague must be isolated. Patients who survive severe septic shock may show a marked necrosis or dry gangrene of the tissues on extremities, i.e., the black death. Doxycycline can be used for post-exposure prophylaxis. Eliminate urban plague with sanitation measures. A formalin-inactivated vaccine is available for adults (18-61yrs old) at high risk, but severe inflammatory reactions are frequent. Primary IM injection followed by boosters at 3-5 mos then another booster at 5-6 mos then 3 more booster shots at 6 mos intervals followed by 1-2 year intervals until not needed. This vaccine is protective against the bubonic form of plague however, it does not protect against the more lethal pneumonic form of this disease. Other investigators are experimenting with a recombinant fusion protein vaccine consisting of the Yersinia pestis F1 (capsular protein) and V antigens. So far experiments in murine models of plague infection have shown great promise in protecting animals against bubonic and pneumonic plague infections. Human safety studies have begun and if all goes well the company producing the vaccine (Dynport Vaccine Company) plans to ask for FDA approval sometime in 2015. ©2010 Neal R. Chamberlain, Ph.D., All rights reserved.